We joined forces with Fig London Interior Design to create the perfect home for our clients just off of Wandsworth Common. This beautiful Victorian home’s interior design was well thought out to highlight all of its best features like the roof in the main drawing room. There is something elegant and fresh about this home that makes you wish that you live there. The calm colour scheme is offset by the touches of colour from the artwork and furnishings. Our plantation shutters act as a perfect solution for window coverings to compliment the home as well as being practical to ward off nosy onlookers. The homeowners chose to cover the windows in seven rooms throughout their home to have consistency in style as well as to enhance the privacy from the street outside. They chose a range of Tier on Tier, Full Height and Café Style shutters to best suit each window. Tier in Tier was chosen for two of the bathrooms to have the freedom to open the top for ventilation while still having the bottom closed for privacy. Café Style was chosen for the bedrooms and living rooms to pair with curtains to have that added privacy during the day and extra insulation at night. 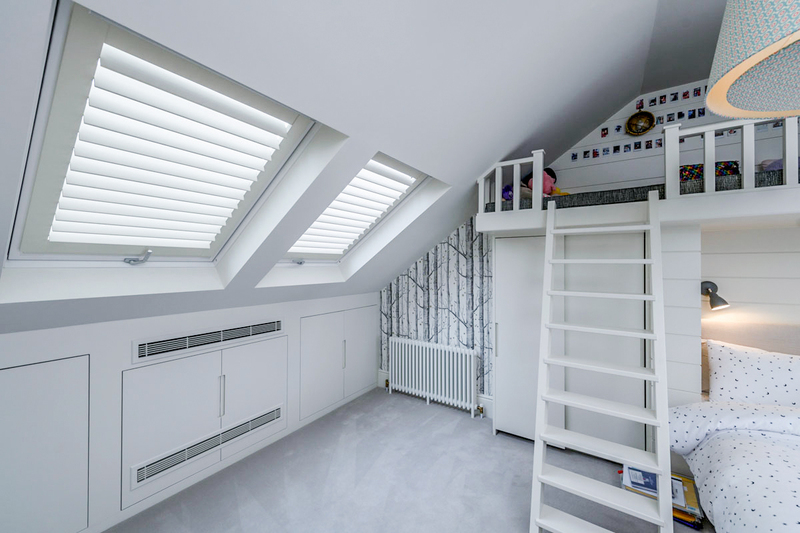 And finally, Full Height Velux Shutters were chosen for the last bathrooms skylights as they are single height shutters making it easier to open and close the window while still giving you maximum protection and light control. To add to the maximum light control Modern (89mm) slat sizes were chosen along with our high-quality material, White Teak, to continue with the elegant style of the home. They then got all the shutters custom colour matched to the wall paint to completely melt into the window frame seamlessly. Join our clients and put your windows on the best-dressed list and Plantation Shutters are the perfect choice for just that. They are durable, easy to maintain, offer privacy, light control and perfectly adaptable for your family requirements. Have a browse through our shutter styles and lifestyle gallery. Our New Year Sale runs until 31st January, keep an eye out for our amazing reductions across our product range so get in touch today, contact one of our friendly team, email or call us 020 8871 9222.